Left ​Gary Andreani in his football uniform. ​The Gary L Andreani Memorial Scholarship has joined the AHS Foundation Family of Scholarships thanks to a $ 25,000.00 donation from Gary’s widow, Paula Cope Andreani. The first award will be presented to an AHS graduating senior in the class of 2018. Gary was a lifelong resident of Alliance, graduating from AHS in 1971. He received his B A degree in political science from Mount Union in 1975 and Master’s degree in educational administration from Youngstown State University. 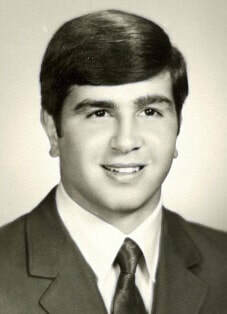 While at AHS, Gary served as vice-president of Student Senate, President of the Varsity “A” Club, a member of National Honor Society, sports section editor for the Chronicle, a Buckeye Boys State alternate, a member of the Aviator Backers, Cap and Gown Committee and the Senior Banquet Committee. Gary played football and baseball at AHS. His senior year he was named the Aviator’s best defensive lineman in football and on the baseball team, best defensive player for his work as a catcher. He played football at Mount Union and earned membership in the Varsity “M” Club. Gary taught Social Studies at AHS and served as assistant varsity coach for football and baseball from 1975 to 1987. He was associate principal and assistant varsity football coach at West Branch High School from the fall of 1987 until his death in 2001. Since 2005, the ‘Rivalry Football Helmet’ has been presented annually in Gary’s honor to the winner of the Alliance versus West Branch football game. Former Aviator head football coach Ron Kuceyeski ’72 was instrumental in initiating this traveling trophy to symbolize Coach Andreani’s contributions to education and the football program at both schools. At this writing, in the annual game for the ‘Rivalry Football Helmet,’ each team has won the traveling trophy six times. Each year, the seniors on both teams receive a replica helmet which, like the traveling trophy, are painted with Alliance on one side and West Branch on the other. Gary’s daughter Erin, AHS 2003 and Miami University 2007, is a Speech-Language Pathologist in the Washington DC area and is married to Ben Shuster ’01. Erin was a member of the Academic Top 10 % and was awarded an AHS Foundation Renewable Scholarship. Gary’s son Eric, AHS 2011, is enrolled at Stark State College. Paula Cope Andreani, a Cadiz High School graduate, is a retired Spanish teacher from the Alliance School system. She still volunteers teaching elementary classes one day a week at Holy Cross Academy, Regina Coeli campus. The Gary L Andreani Memorial Scholarship will be awarded annually to an AHS graduating senior who is enrolled at Mount Union. In addition to this scholarship, the family has also endowed two scholarships through the University of Mount Union to be awarded annually to one Alliance and one West Branch student attending Mount.